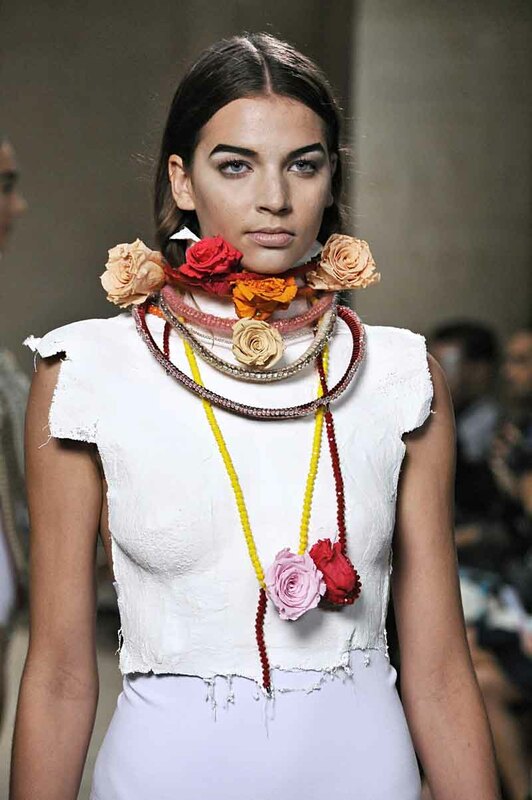 PARIS, Jul 12, 2014/ — With disconcerting proportions, the new EYE collection from VASKOLG relates the story of jewelry designer Olga Kiwerski journey to India. A traveler by nature, Olga Kiwerski grows in an artistic environment trying creative experiments with passion on what she experiences and sees on her travels. And thus, VASKOLG jewelry which is aptly described as “sculptures to wear” evokes heightened sensitivity and a feeling living dangerously. Taking a cue from German-born Swiss surrealist artist Meret Oppenheim who said, “Freedom is not given to us, we must take it”, Olga Kiwerski focuses on craftsmanship and high-end expertise to imagine the sculptural jewelry VASKOLG. She proposes architectural and rhythmic body adornments in limited edition or unique piece. Purist with a baroque soul, Olga reflects the contemporary, implies a future. Materials express strong emotions and ecological philosophy: Euphoric notes of gold and silver threads, lava stone, metal, feathers and true eternal roses, crystals and leather, paper, labradorite and onyx, old wild silk saree, pearls and corals, pure ceramic and precious wood, and new technologies (audio player, articulated light system, USB key…). Sudden ocher and scarlet color strength punctuates gray, white or silver monochromes of statement necklaces that witness sensuality and power. This season, VASKOLG evokes a triumphant but generous Amazon wearing sparkling protecting armors. The VASKOLG sculptural jewelry fashion show is a rare and unique opportunity to showcase the ornament. Here jewelry is not an accessory, but subject, verb, quintessence.